Somewhat Quirky: Dress It Up! Good morning to you! I wrote this post a couple of weeks ago for guest spot for Bella Nest's Drab to Fab series. Holly invites guests to come by and show off their restoration projects - taking things from drab to FAB. This project is actually a Drab to Fab Double Hit. 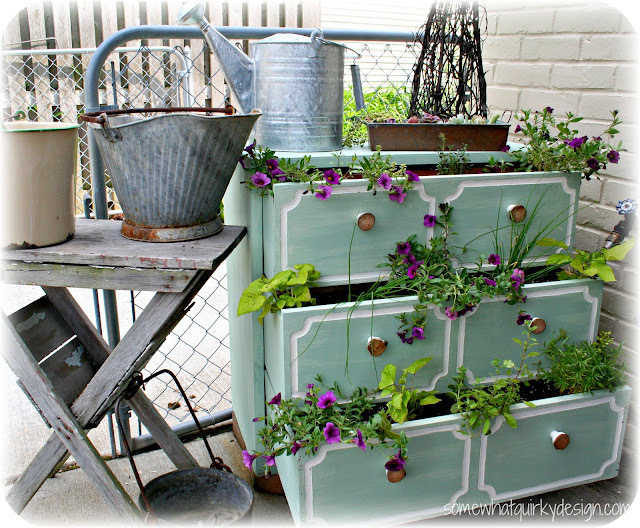 I'm going to take a very drab part of my driveway/backyard and fab it up with an oh-so-drab dresser transformed into a planter. 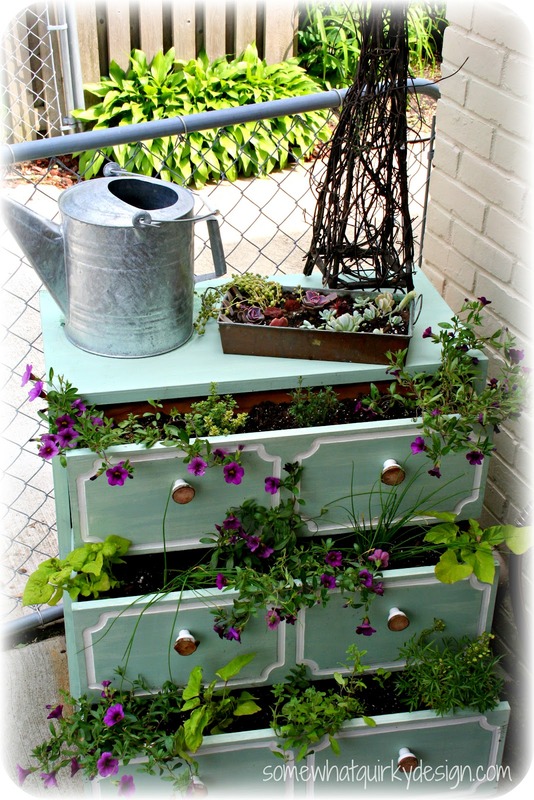 A "planter dresser" or "dresser planter" - not sure which is the appropriate name - was one of my first Pins. I wasn't sure if I could make it work because it rains 55 - 60 inches a year here and that is a LOT for a piece of furniture meant for indoor use to take. 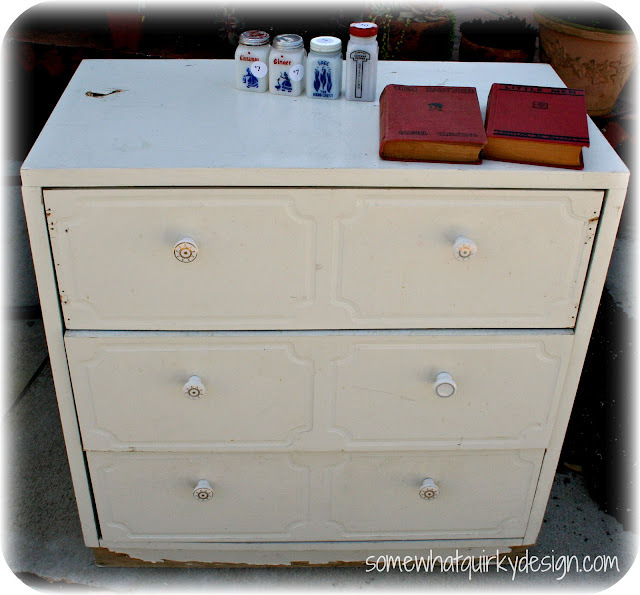 I figured that a dresser would be good for about one summer/fall in Michigan. After that it would probably be toast - and would have to be thrown away. That meant that my already low spending tolerance for junk furniture would be even lower. But never fear.....estate sales are here! And I found this baby for $5.00. 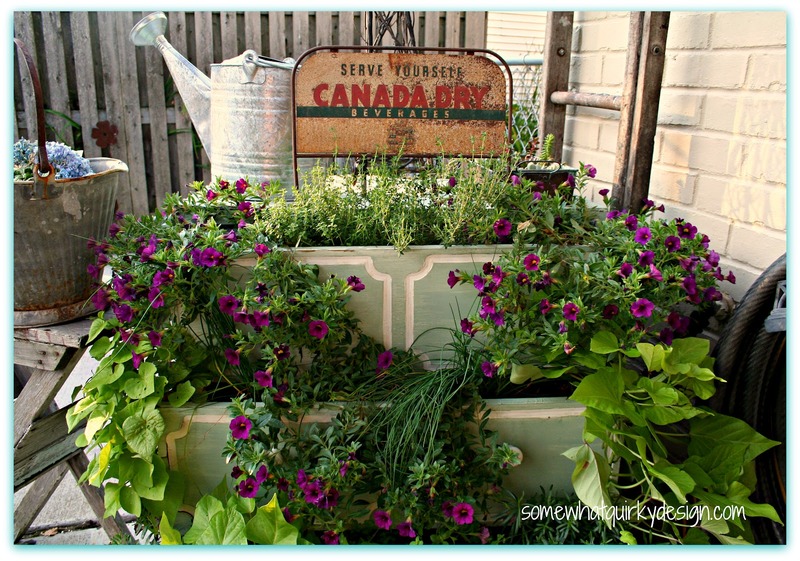 A perfect investment for a throwaway planter. Then dry brushed it with CeCe Caldwell paint in Alaskan Tundra Green. I only had the small sample size - thus the dry-brushing technique. I used every drop of the sample size. The girls at Bungalow 47 where I buy my CeCe Caldwell paint didn't recommend it for outdoor use, but I thought I would do my own little test on this. This paint is clay based and I think it might be more durable for outdoors than they think. I used to CeCe Caldwell Vintage White for the accent painting. If you are making a planter dresser, be sure to paint the sides of the drawers. They are usually untreated wood and the paint will provide a little bit of protection for that wood. Then I put it where it was going to live and prepared the drawers for planting. I had no intention of filling the whole drawer with soil - that would be A LOT of dirt - so I cut some scrap lumber to fit snugly into each of the drawers to mark off the space where I would put the dirt. IMPORTANT! 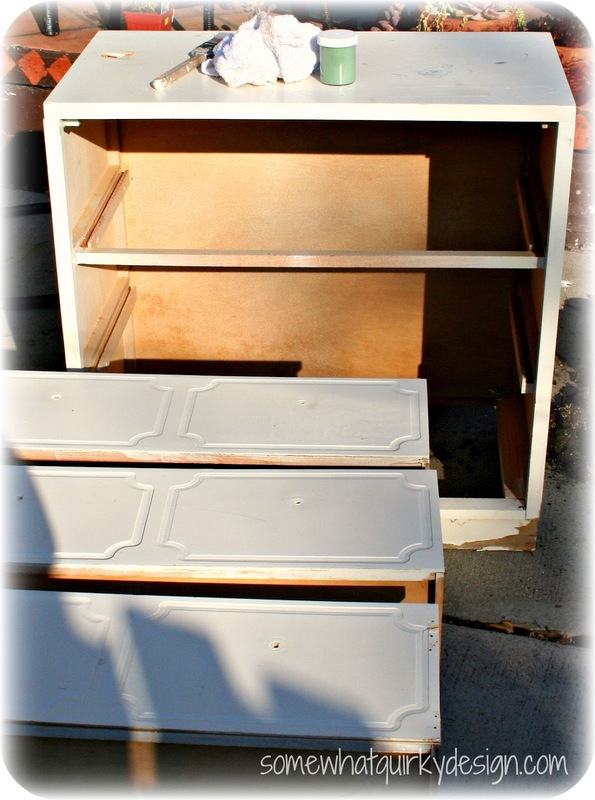 The dresser will get really front heavy and fall forward if you don't do something to weight it at the back. I put two heavy edging stones in each drawer behind the divider panel. I didn't want the dresser to be sitting in standing water repeatedly so I used the same edger stones to raise it off the ground and let water flow freely underneath it. I also used the stones to support the bottom drawer. You will figure out that this is essential about the 2nd time that the dresser falls forward when you are setting up your drawers! 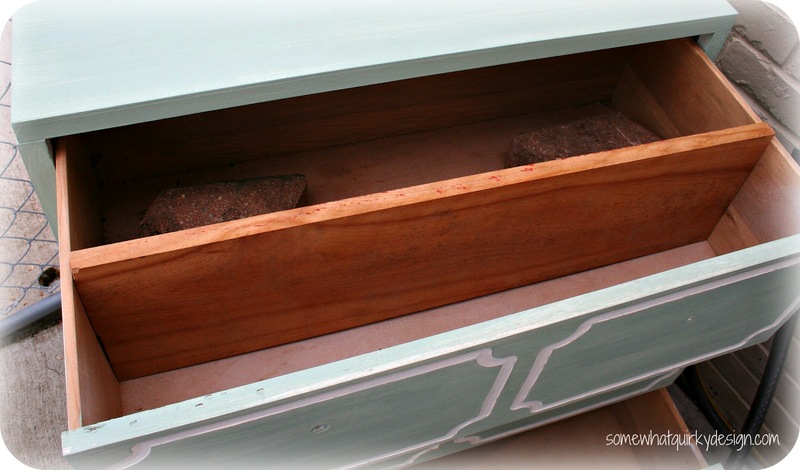 The stones inside the dresser will hold it upright without the dirt, but I was afraid that once I put the dirt and plantings in there would be a disaster. I covered those ghastly knobs with some slices of a tree trunk (dead) that I cut into disks. I was a little worried that the knob behind would look bad, but once I put them on the drawers they looked better. 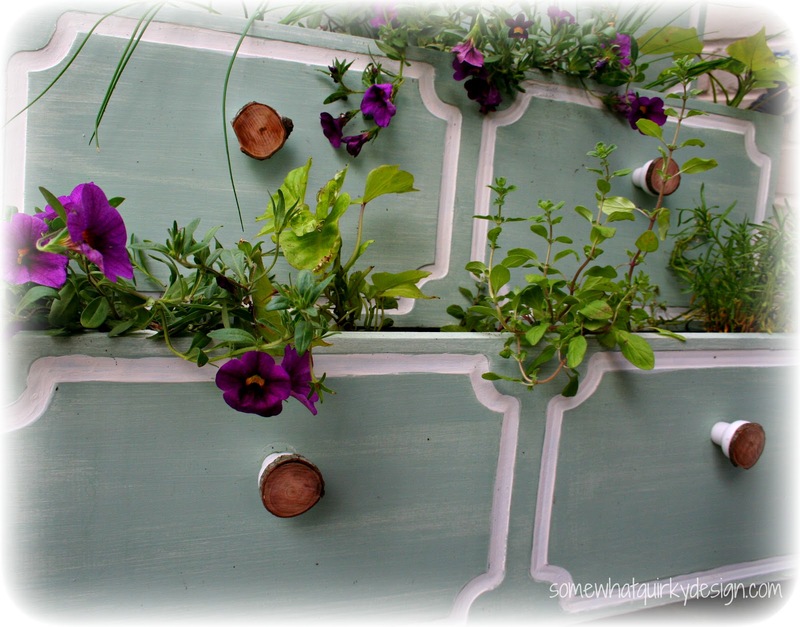 Once the plants grow in the back of the knobs won't be visible anyway. This little area is one of the saddest spots in the back yard. It needs to stay relatively clear so we can use the hose regularly (we don't have a sprinkler system). But it ended up being an area where I put stuff until I "decided what to do with it" or it gets ruined by dragging the hose across it. I wanted so much to be able to fit the dresser in front of all this stuff, but there just wasn't a way to make that work. I tried really hard to get a picture that fully captured how much better this drabby concrete corner looks with this little planter. None of the pictures really did it justice. You are going to have to trust me. 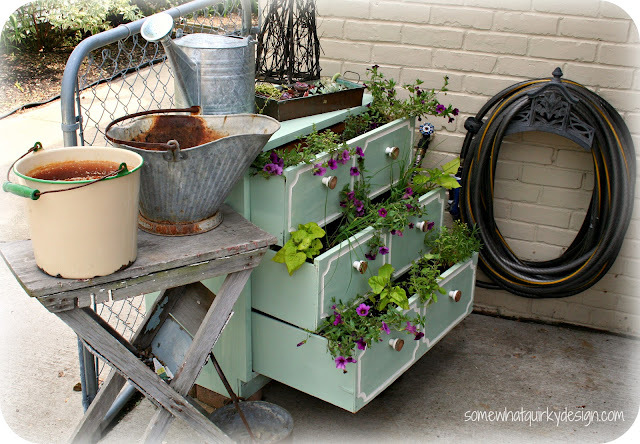 This is one FAB little corner now with a FAB little planter made from a junk dresser. If you don't trust me, you can just stop on by for a little back yard cookout and a glass of wine. This little corner is the first reveal of my spring patio makeover. Which I must say turned out pretty darn cute! Oh look at how it filled out! This picture taken in July. I saw this on Furniture Friday, what a great idea! those knobs were a great idea, i love it! 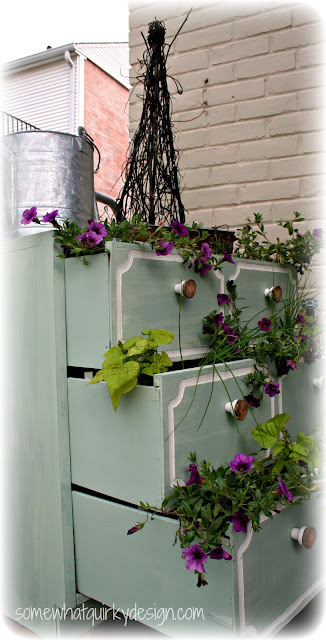 You gave me an idea for using a little cabinet I have in my garden. The dressed up dresser is really sweet. The cool color is divine. And what a stroke of luck to have just enough for your project. I've tried spraying some of my outdoor projects with the clear coat that is used on auto paint. It's available in any auto store and seems to have worked so far. But, most of my projects have only weathered one and (now) an additional partial summer season. So far, so good. I'm visiting from Tuesdays Cowgirl up linky party. Your dresser is adorable. 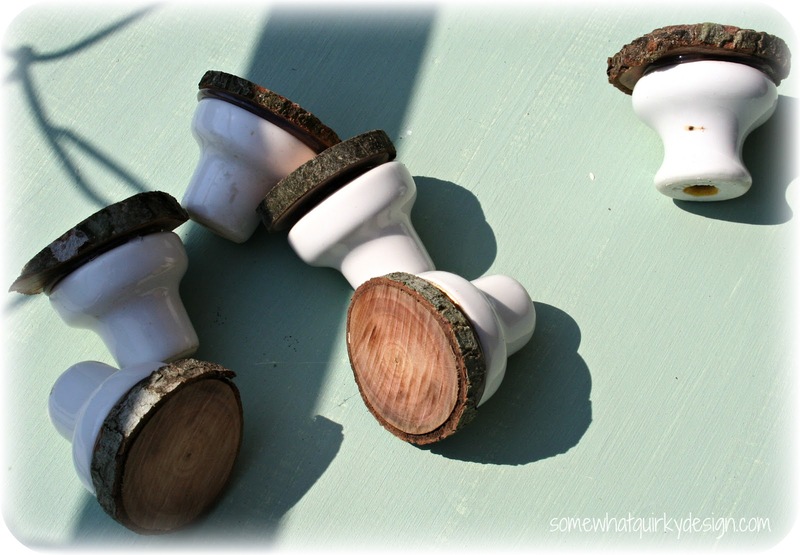 I love the refashioned knobs. Thanks for sharing. 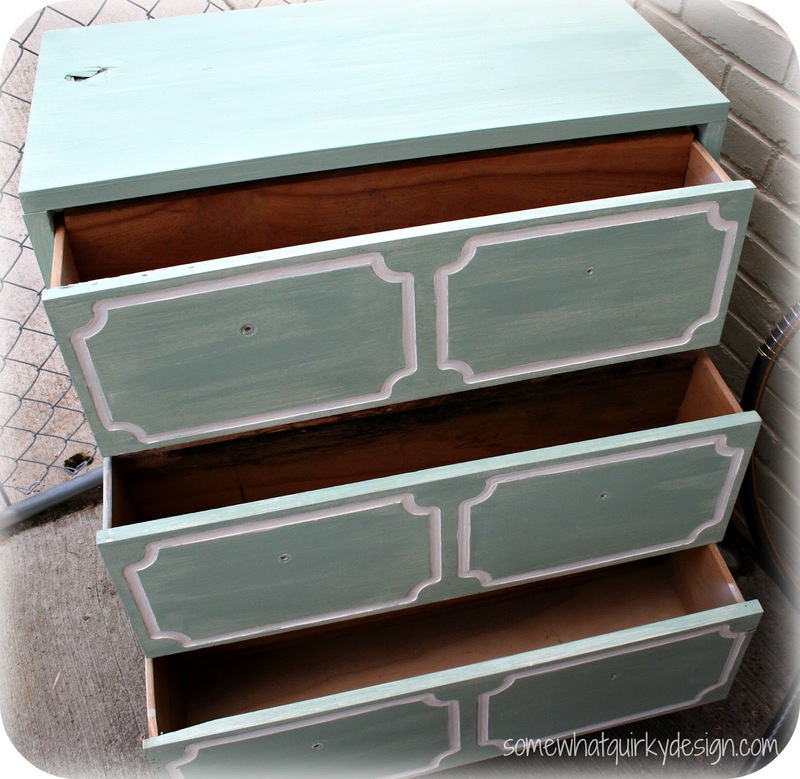 I love how your dresser turned out. I have always wanted to make one and yours is awesome! Thanks for the inspiration. I am in love with this dresser planter!! The color is beautiful! so pretty! i love it all dressed up with flowers! Great idea I love it!1 The color is fantastic and the plants are so pretty. Just terrific. I'm in love with this. Thanks for linking it up with Toot Your Horn Tuesday. I'm featuring it today...would love for you to come grab your feature button! Congrats on a great job! Stopping in from Bliss Ranch. This is HILARIOUS... awesome, but hilarious for me. Great idea for the dresser. FANTASTIC implementation! I can NOT believe you landed a Vintage Dorothy Draper Style dresser for $5!!!! $5!!! Granted it would have needed work... but... A-M-A-Z-I-N-G! Great job. Perfect touch on the knobs! I remember this! Love it. I did one for my sister's wedding! I love this Karen! Now I need to go garage saling for a dresser. So very awesome! Karen, this project is AMAZING! Great tutorial with wonderful tips!